Former Western Australian mare Miss Rose De Lago made a winning debut for new trainer Danny O’Brien with a narrow victory in Saturday’s $80,000 PFD Fresh To Go Handicap (1200m) at Caulfield. A Group 3 winner in Perth as a three-year-old for former trainer Simon Miller, O’Brien said the plan was to try and get the four-year-old’s rating up in order to target better races in the Spring. 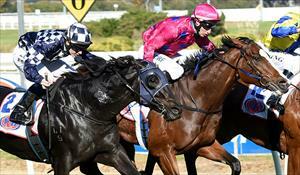 “She’s a lovely style of mare and I’ve been lucky enough to get her over from Perth,” O’Brien said. “She’s been in work for nearly three months to have her ready for her first-up run, she’s a big, gross mare so she’ll improve with the run and I suspect the way she raced today and looking at her previous starts, over 1400 or a mile (1600m) she’ll be at her best. Miss Rose De Lago ($3.70F) overhauled the early leader Judicial Rock ($8) in the dying stages to win by a short-neck, with Nautical ($6) running-on into third a further short-half-head away.